Happy Sunday everyone, hope everyone is have a great day so far. Today I thought I would share 'What is in my bag'. I did post a Handbag Essentials a few months ago but I thought I would update you. First of all the bag that I am using at the moment is this beautiful bag that I got for my 18th birthday 2 years ago. It was from my parents, from Marks and Spencer's. Like I said I have had it for a few years now but it is still in tac and perfectly suitable. It has three compartments, as well as the pockets at the front which is perfect to hold all my stuff. I don't have specific places for each items but it is great for holding everything. I absolutely love this bag and I love the colour, it is so useful for shopping and going out. 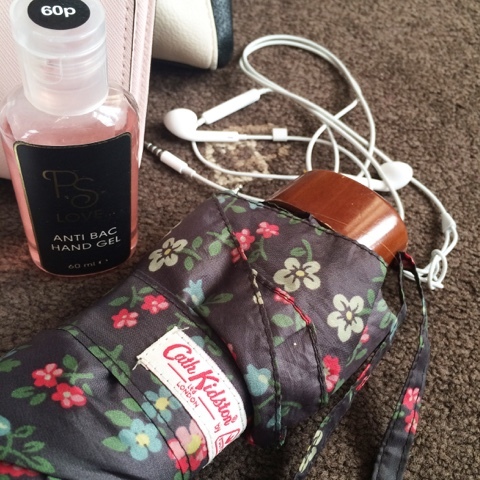 Now it is Autumn/Winter an umbrella is completely essential, I am in love with this Cath Kidston umbrella, it is so pretty and I love it so much. You never know what the weather will be like in the UK so I will always have this in bag. Hand Gel will also always be in my bag, it goes without saying why you need hand gel in your bag but this one is actually from Primark and is the nicest smelling one I have came across. Head Phones again have to be kept in my bag. They are just the average Apple headphones but they do the job. I could talk about Elizabeth Arden Eight Hour Cream for days but like I mentioned in my Autumn Essentials it has been a life saver. I love to keep them both in my bag. The Hand Treatment obviously for when my hands get super dry and they need moisturised , but also The Skin Protectant. I find this amazing to help dry and chapped lips, with the colder days now drawing in this will be a must have. 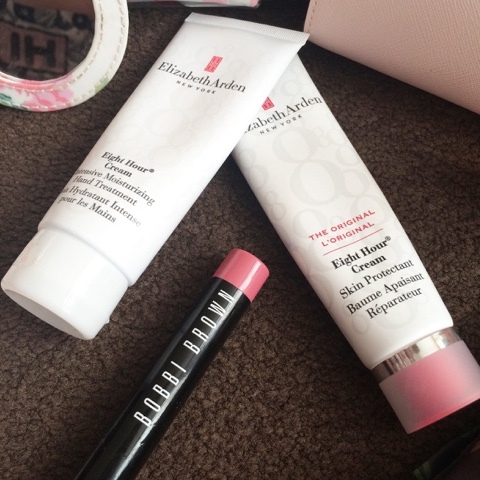 It is so handy just to apply on your lips if you don't feel like lipstick. On the contrary, I keep what ever lipstick I have been wearing that day, I have been wearing this Bobbi Brown Dusty Pink recently. Then I have my new make-up bag which, as you can tell, is from Victoria Secret. 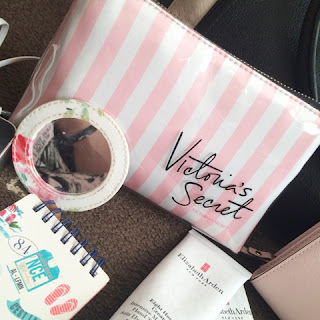 I absolutely love this make-up bag. I purchased it whilst in America and it is just so pretty. I love the colours and find it is just 'So Me'. 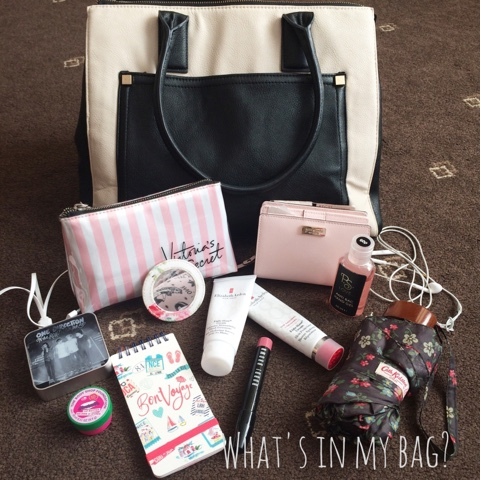 If you want me to do an updated 'What's in My Make-Up Bag' let me know as it has changed. 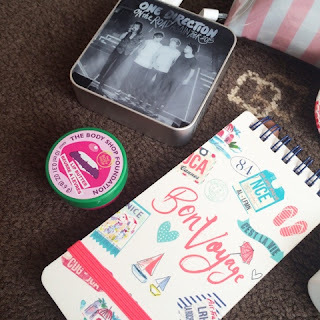 The last three thing that I keep in my bag are my One Direction Portable charger. A few weeks ago I went to see One Direction, I went VIP. The package came with a free gift. Last tour it was a watch that I have never seen since but this time they gave you a charger. It is the best thing ever, it was fully charged which meant I used it on the night. It is great to have as IPhone battery is shocking, it also tells you how much charge it has left. Props to the 1D team. Then I have a Body Shop lip balm that has been in there for a while, but it has a watermelon scent so I can't throw it away. And Lastly, A notepad. If you seen my birthday haul then you'll know that I received this from my Gran and Auntie. It is the right size for my bag and really handy to jot down ideas and notes. I also carry my purse which you can see in the main picture. 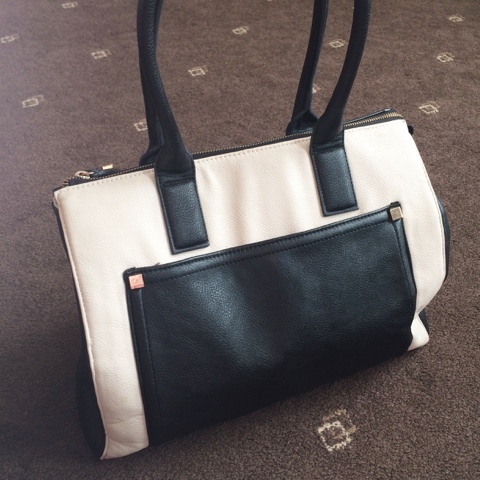 My purse is from Kate Spade and I purchased it whilst in America, the size makes it really easy to fit into any bag. I hope you enjoyed nosing in on my Hand bag.